As a result, the Tories’ chances of winning the most votes are up to 73% and their chances of winning the most seats are up to 75%. 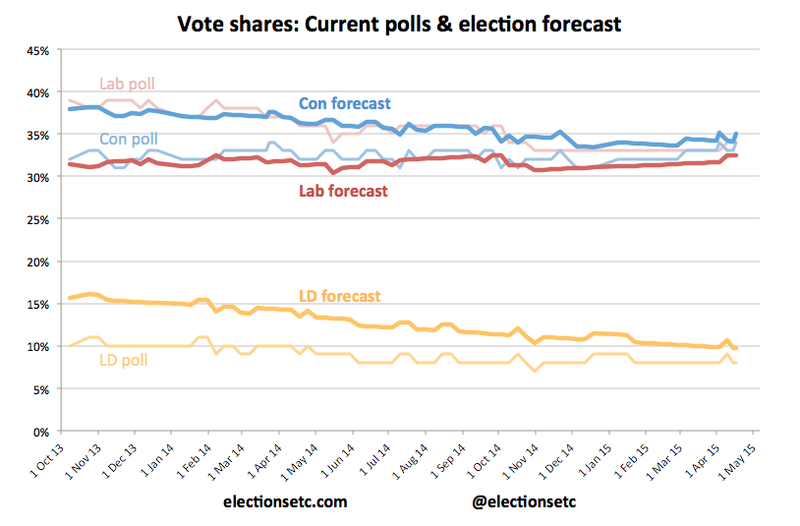 The probability of a Tory majority is also up slightly, but it’s still just 11%. The probability of a Labour majority is down to less than 0.5%. 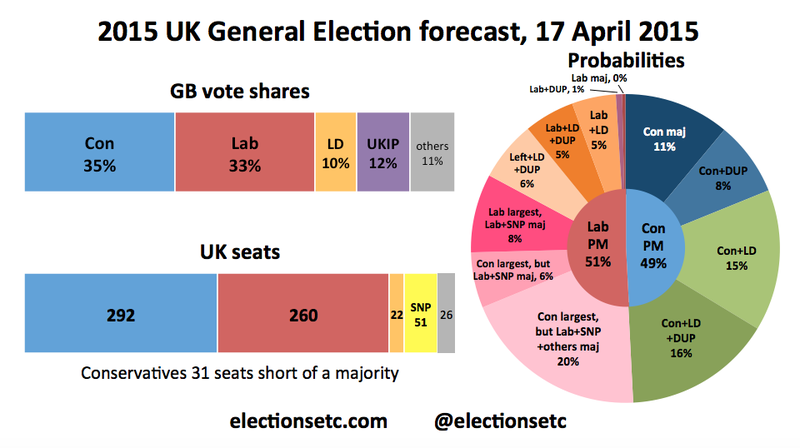 A hung parliament still looks very likely, with an 89% chance. We now make David Cameron and Ed Miliband pretty much 50–50 to be Prime Minister. Cameron would very likely have to rely on the Lib Dems though: we give the Tories just a 19% chance of being able to command a majority without them, either alone or with the DUP. Similarly, Miliband would likely have to rely on the SNP: we give Labour just a 17% chance of being able to command a majority without them. Without either the SNP or the Lib Dems, Miliband’s chances of a majority (alone or with the DUP or with the other left-wing MPs) are just 1%. Despite what they to the pollsters, I think a lot of LABOUR supports will just stay at home because they can’t be enthused to vote for Miliband. Personal ratings play a big role in parties managing to get their vote out on election day. Q: How do you know UKIP will not take 5 seats of the tories? or even a seat of labour? Reason for asking is, UKIP are not really caring about the overall % picture. There are doing targeted HEAVY campaigns in a select number of seats.